They have been especially sweet, with your hands getting sticky just taking the wrapping off – the corns just burst they are so full. We have processed and frozen 24 cobs – enough to last us until next year. We have about 150 more cobs left. I have taking the wrappings off and laid them out in the Conservatory – as above – to dry out and they will become great chicken treats to last them through the long winter. Totally spoilt. Potatoes are pretty good this year – but there seems to be a few plants with blight. Odd that it attacked just some, and not the rest. I’m inclined to think that the individual seed potatoes were infected. Allotment is now being dug over and prepared for winter – when it has been dug properly the contents of the animal shelters will be chucked over it – this will rot down over winter. The Alpaca poo does not need to be rotted down before being put on the soil – and the large amount of straw and wood shavings really improve the soil condition. All we have in the soil outside now is Sprouts, PCB and Leeks. In the Poly we have salads, chillies and the second pea crop – which did suffer a caterpillar invasion – but seems to be recovering. I reckon too late for a crop though. Half the Chillies we have strung and hung up to dry, leaving the rest on the plant in the poly. 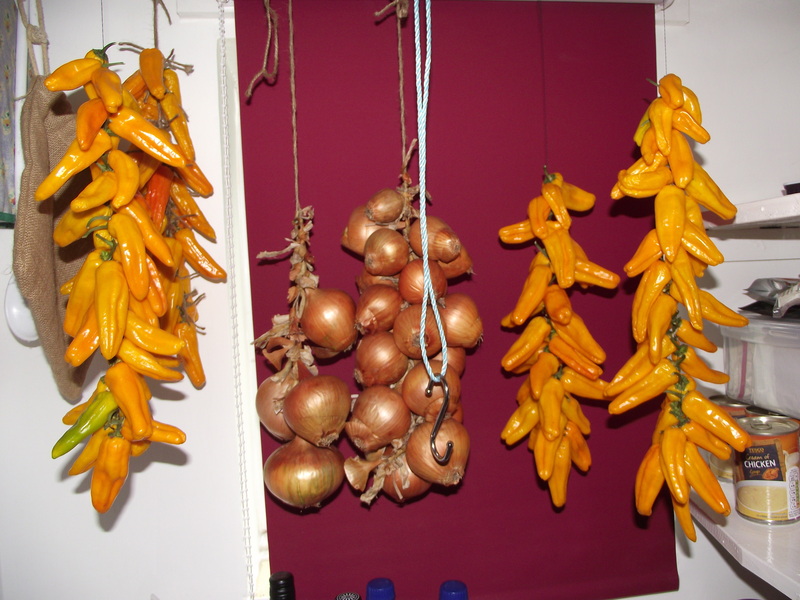 These are the drying Chillies in the pantry – the hanging rope was used to hang the grapes as they filtered out to a bowl. It’s a useful space to have – a walk in pantry with a space to hang stuff – the remains of last years onions can be seen – they are drying out a bit now but still going!